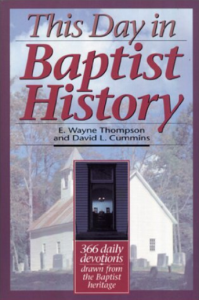 This is a daily journal of 365 readings drawn from Baptist history. Each entry is about a page long, interesting and documented. The book can be ordered by calling BJU Press in Greenville, S.C.
Dr. Harju gave me this book a year ago and I have spent five minutes each evening reading each day’s entry (Some teachers’ assignments never end!). In addition to familiarizing myself with names, places and events from my own heritage, I have filled my illustration file with true illustrations that are concise and well written. I was most surprised at the amount of information one seldom hears concerning the persecution and suffering of Baptists in America over the last two hundred years.